Annual Inspections – Summit Anchor Co. Summit Anchor Co. is qualified to perform annual inspections, as well as can help clients to comply with OSHA standards whether its new anchorages or retrofitting an all new fall protection system. 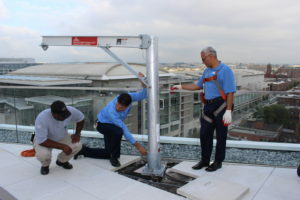 Does your building comply with the latest OSHA height safety regulations? Window washing companies, suspended maintenance providers and construction companies need proof of secure anchorages before working on a building above four feet. According to OSHA, building owners must inform the contractor in writing that the building owner has identified, tested, certified, and maintained that each anchorage can support at least 5,000 pounds (268 kg) in any direction, for each employee attached. What does this mean for building owners and property managers? For over 20 years, Summit Anchor has operated with this guiding principle: respect life by providing complete fall protection solutions. Worker safety in high-risk jobs is our primary concern. We want workers to go to edge with Summit Anchor.